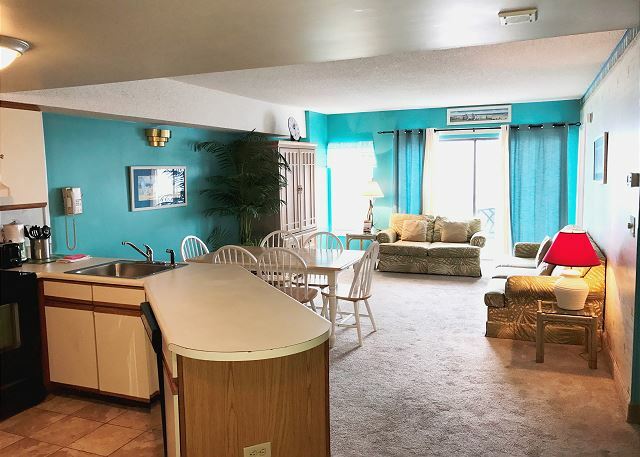 Palace Resort is the perfect spot for a fun filled family vacation or a romantic getaway overlooking the sandy beaches of Myrtle Beach and the Atlantic Ocean! 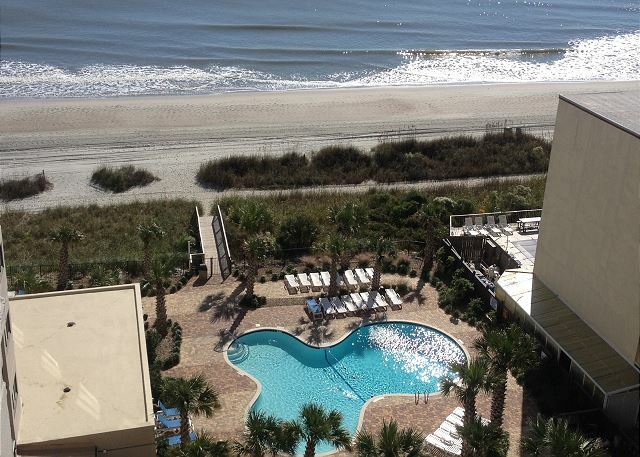 The Palace Resort is ideally situated on the south end of Myrtle Beach. 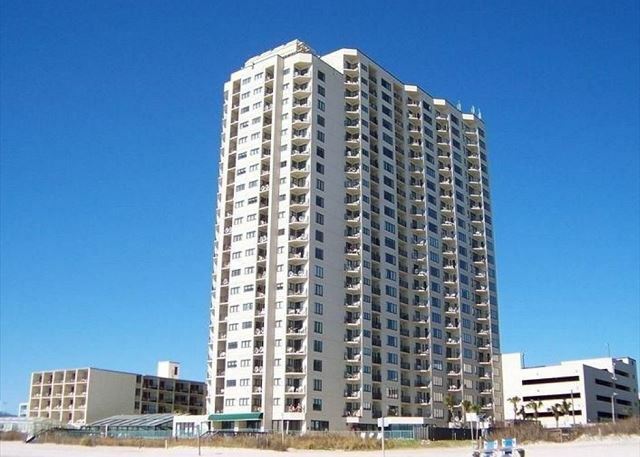 Palace is an oceanfront resort; step down from the pool deck onto the beach! 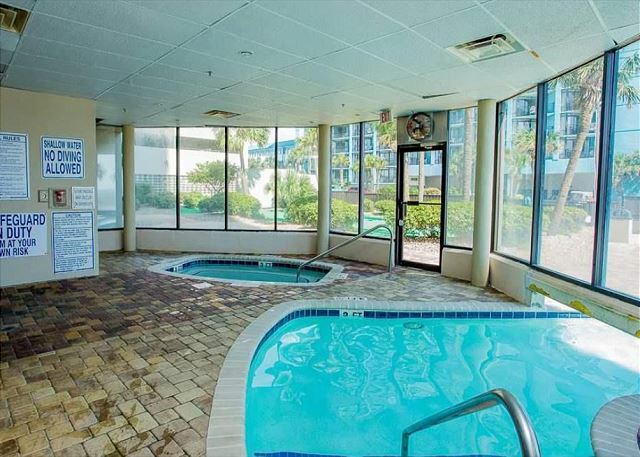 Take a break from the beach and swim in the indoor pool or one of the two outdoor pools. Practice your short game on our putting green. 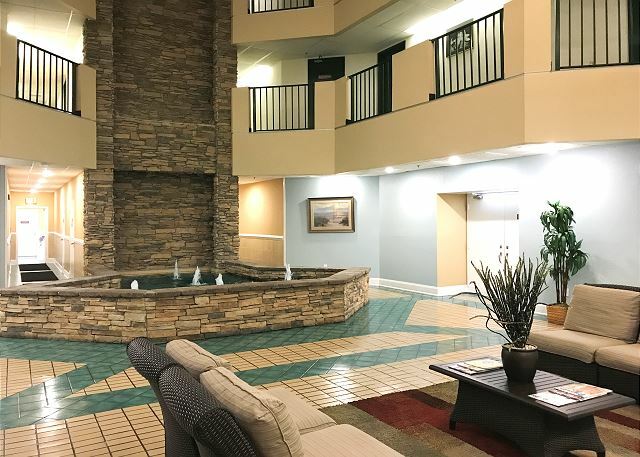 Relax your muscles in one of the 4 hot tubs (1 indoor, 3 outdoor). 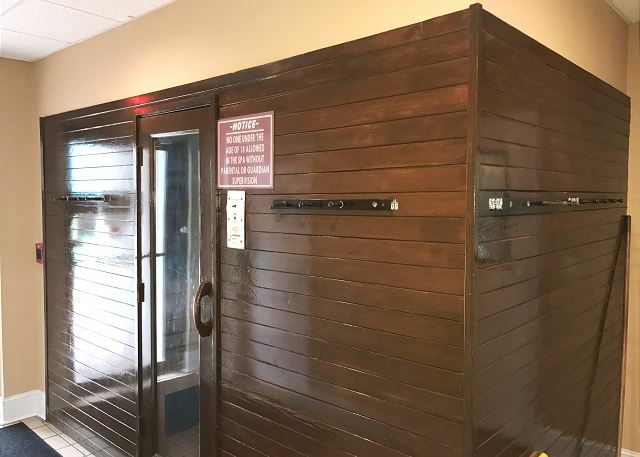 Palace resort also has a steam room, sauna, and fitness center. Or enjoy a cool beverage at the lounge with ocean views, also offers a seasonal restaurant. Or grab the kids and play some games at the arcade! Palace Resort has a coin operated laundry facility, Free parking, and Free Wireless Internet! The master bedroom features a Queen Size bed, private restroom. The guest room also features 2 twin beds, flat screen TV and private balcony (overlooking Ocean Blvd). Palace Resort is walking distance to a Neighborhood Walmart, a small ice cream shop, a several restaurants. 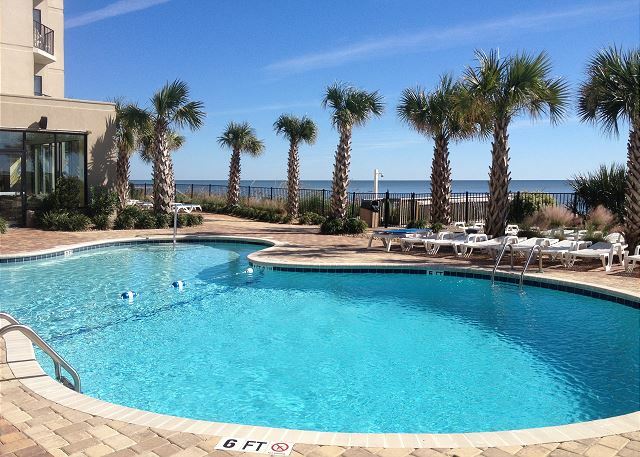 You are about a 15 minute walk (1 mile) from the Family Kingdom, Splash’s Waterpark and where the Boardwalk begins. You are a short drive from MYR (Myrtle Beach International Airport), The Market Commons, Broadway at the Beach, a plethora of restaurants, and a variety of entertainment venues (Wonderworks, Hollywood Wax Museum, Legends in Concert, Ripley’s Believe it or Not, and where the Country Music Concert is held). Grab your umbrella and beach chairs and join us at the Palace Resort! Overall, we had a great vacation. Myrtle Beach has no shortage of activities. The unit we stayed in the Palace was quite dated, tired looking and needed some attention. All lampshades were dented, torn or ripped; the carpet was very dirty and gross; A/C was very loud at night for the person sleeping on the couch but neither bedroom had a ceiling fan so we couldn't turn it off; and there was a terrible whistling from the wind off the ocean each night, which made i t hard to get a good nights rest. The whole building just looked like int need a facelift. Also, for out of state guests, it is really inconvenient to drive in the opposite direction of the unit we were to stay in to pick up the keys, then drive back to drop them off before we left. Really need to have a closer location for key pick up for guests. Thank you for bringing this to our attention. We apologize for the inconveniences you faced during your stay, as that is not up to our normal standards. We will share your feedback, get the carpets cleaned, replace the lampshades and have the air conditioner serviced. We do have 3 offices to pick up your keys, North Myrtle Beach, Myrtle Beach (off of Hwy 501), and Surfside Beach. 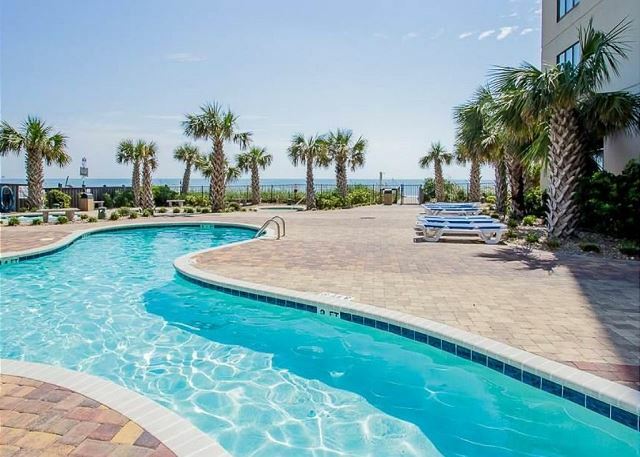 Most of our Myrtle Beach guests drive and travel into the beach on Hwy 501, however we can arrange the keys to be picked up at other location is if is more convenient. We hope you choose to stay with us again, so we can show you our true level of service. We were pleased with the rental. clean and stocked well in the kitchen. the only thing was that the mini blinds needed replacing in the master bedroom and the door to the balcony. The condo was nice for my family of 5. The location was fantastic along with the views. The elevators at the complex would be our only complaint. They kept breaking down and there were only 3 elevators for all 23 floors, so the wait to ride an elevator was very long. We got a lot of exercise taking the 8 flights of stairs. The condo itself has a little damage (holes in the walls, some holes in the sofa) and was a little dated, but overall we had a nice experience, as the location made up for those things! Very quiet, love the layout of the hotel and the 22nd floor hot tub! Friendly and helpful staff, nice pools. Only complaints would be the elevators (literally waited for 25 minutes to get downstairs for check out, and long waits throughout the week as well) & having to pick up and drop off the key 30 minutes away... Otherwise, the suite was very nice & peaceful - just what we were looking for! I would describe my experience at the Palace itself as someone disappointing. As soon as we arrived there were already issues. The elevator in the parking garage was not working because it was "due for scheduled maintenance." If they are going to schedule maintenance it should be in the colder months when there are not many people staying there. We had to use the stairs which was a pain because we had to make multiple trips with all of our luggage. Then there was an issue with the elevators in the main building as well! Only 2 out of the 3 were working. There was always a line to get on the elevator so sometimes we would have to wait for the next one and it always took an extremely long time. It was even worse if you were going down on the elevator because every time the door would open the elevator was already full since there are 23 floors and only 2 elevators. We ended up taking the stairs every time. One of the pools was also closed for several days because there was apparently glass in it. It just seemed like nothing was in working order. The condo itself was okay. The kitchen was a little dated but it didn't bother me. Everything worked which is what is important. I was a little grossed out about the beds which had stains on them. There was also a tear in the couch. I think the unit probably needs to be updated a little bit but other than that I was decently satisfied with it. I also liked that we were right on the beach so we could come and go to the beach as we pleased. Overall I had a pretty good vacation but if I ever return to Myrtle Beach, I will not be staying at the Palace. We are pleased that you enjoyed our convenient location at a price that you could value! 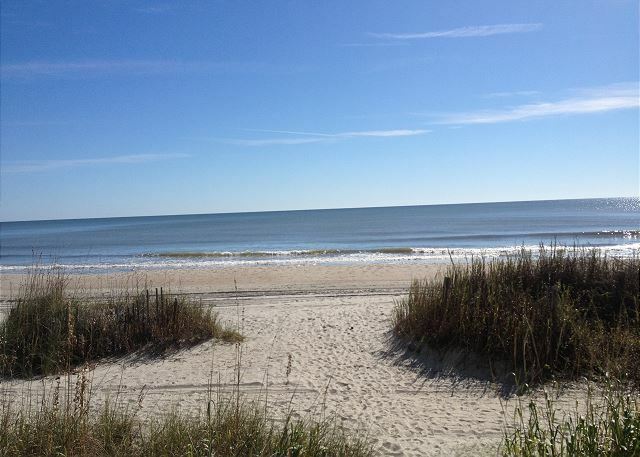 We hope that you had the time to see and do all that you wanted while visiting Myrtle Beach! We regret that you experienced some issues with elevator, parking garage and the pools needed to be shut down due to hazardous conditions. As for the condo itself, we thank you for your feedback and will look into the tear on the couch and the stain on the comforter, we apologize. We are grateful for your feedback and hope that you will back to see us again soon. Ellen, we are glad that overall you enjoyed your stay with us. Thank you for pointing out things we can improve on as well. For your convenience there is a flat screen TV in the guest room and the living room. We hope to have the opportunity to welcome you and your family again and you choose to stay with Southern Coast Vacations. Great location but needs updated. Furniture was very uncomfortable. Been coming to Myrtle for 10 years now and this is my new go to! My family and I stayed here for 6 days from Sunday to Friday. The palace is located in a central area right off of ocean blvd and 17th ave, only a little under a mile to get to the boardwalk where all the activities are going on. Right across the street is the spring garden breakfast restaurant so you don't have to go far for breakfast. The palace 813 condo was in perfect condition! 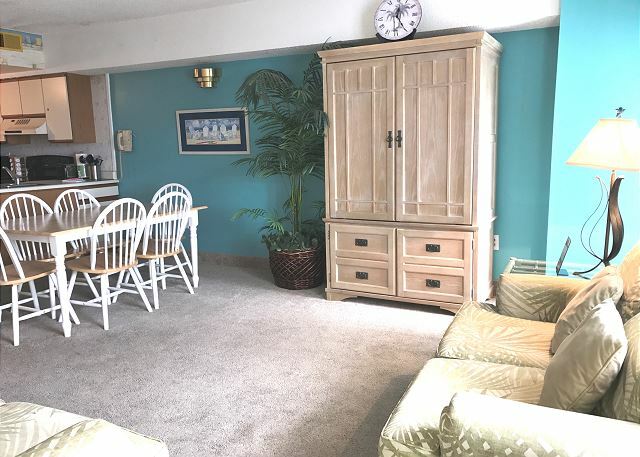 The condo has a beach theme decor and it's very spacious. There's two bed rooms one queen bed in one and two twins in the other with a pull out couch in the living room alongside a love seat. 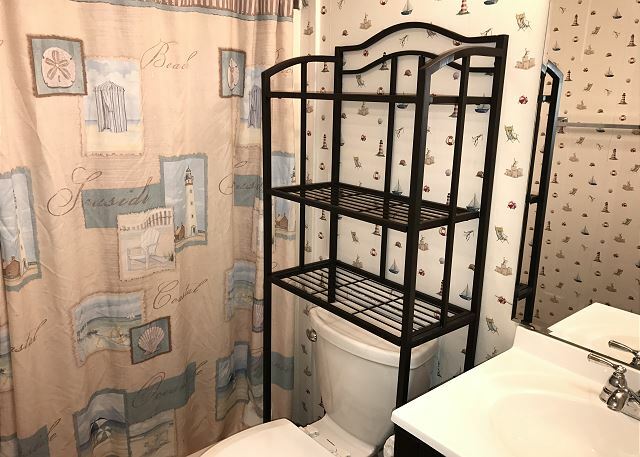 Two full bathrooms as well. There are also two balconies, one of the balconies has access from a sliding door in the living room and also the master bedroom and has a beautiful beach view. The other balcony has a street view and is accessed through the guest room. The rooms were very clean and all linen was provided. The kitchen was fantastic it had every single pot, pan, and utensil we needed alongside bowls, plates, and cups. The palace property was fabulous as well. There are two outdoor pools, one being heated and the other not. There are three hot tubs surrounded by palm trees giving it a great feel with beach music playing through the palace outdoor speakers. There are two beach access paths from property. Also the palace has a bar and restaurant. The only con I had about the palace would have to be the elevator wait times, sometimes they were ridiculous. Luckily we talked to the maintence man and he said in the near future that's getting fixed to speed up elevator times. We appreciate your kind words and very detailed review. We hope to see you next year! 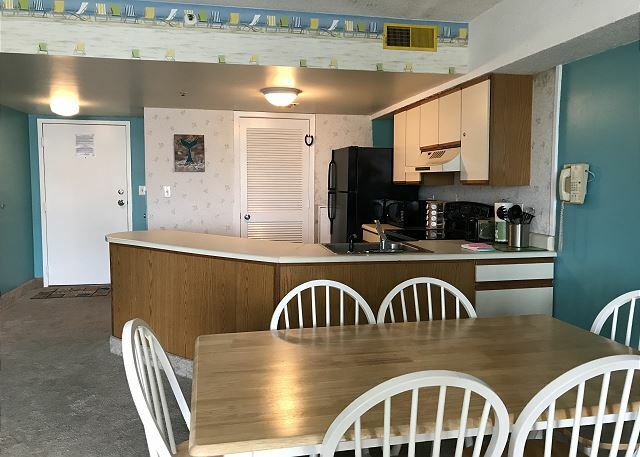 The unit, resort staff and accommodations were lovely; the unit is rather dated but the view was worth the price for rental. 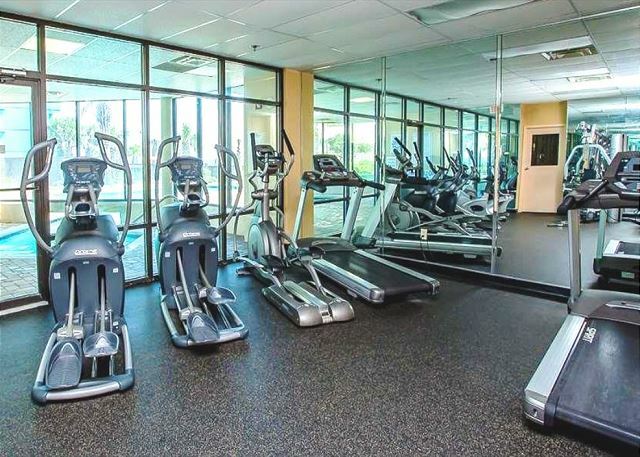 Close to everything, this nice little 2 bedrooms condos is very nice. good price, great week ! Thank you for staying with us! 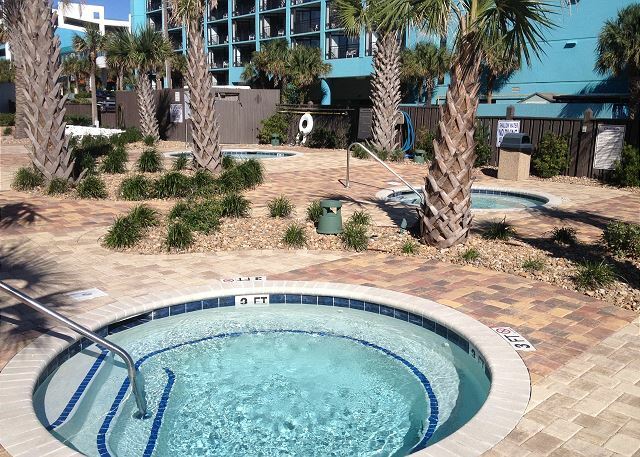 We hope when you return to Myrtle Beach you will choose Southern Coast Vacations. My wife and I went with another couple to this 2 bedroom condo. When we arrived, the staff was courteous and helpful. There was ample parking. The lobby was o.k, but the large black mats in front of the elevators were unattractive. the 2 bedroom unit was light and airy with a Caribbean feel. It had partial ocean view from the living room and one bedroom. However condensation within the floor to ceiling widow pain in our bedroom somewhat obscured the ocean view. The unit was aged but clean. The the swimming pools were well kept, clear and clean. The jacuzzis were nice and hot. Although the temperature was warm the nice ocean breeze made it comfortable. The music pumping out of the concealed outdoor speakers created a nice atmosphere. There weren't a variety of places to eat close by, but certainly adequate. The actual condo unit was clean, comfortable and homey (4Stars). Felt like I was staying with relatives. That said the building was less clean and the condition of the elevators bordered on unacceptable. They operated incredibly slowly and even our 8th floor ride left us feeling uncomfortable and concerned that the elevator was going to leave us stranded. Love Myrtle Beach. Room was just ok. Sliding glass door handle broken. Awful smell (urine) in the spare closet and the front fell of 1 of the drawers in the kitchen. We are sorry that you were dissatisfied with your stay. Our records do show that we repaired the sliding door handle and kitchen drawer during your stay. We will certainly look into the odor in the closet. We were worried about some of the bad reveiws, but we loved the Palace 813 and will come back! We had 4 teenagers with us in a two bedroom condo and had plenty of space! Loved the beach, Loved the pool area. The outside area was very clean. The building was older, but it was still clean. We were also worred about the long wait for the elevators. It didn't happen. Never had to wait for more than a few minutes. The only complaint was that the condo/hotels on the North side were sketchy. I wouldn't let me teenage daughter walk alone. There was a full time security guard at the Palace and he was fantastic. The beds were super comfortable too..Had a great time! Love Myrtle Beach! We are so glad that you enjoyed your stay at Palace 813! The owner really tries to keep the unit updated and current. We hope that you will choose to stay with us again!